The AIIM 2003 Exposition and Conference, billed as the largest document imaging show in the U.S. this year, will take place on April 7 - 9 in New York City. For details, see http://www.aiim2003.com/. LizardTech is listed as a participating vendor of the Exposition, located at booth 1030. Here we thought we could finally get a personal look at the latest "Document Express" software. Suprisingly, the AIIM show event is not mentioned on the LizardTech website, and this causes us to take a look at the latest floor map for the AIIM Exposition. LizardTech is gone! Booth 1030 is gone and the space is now merged into Booth 1028. Oh well, guess the latest "Document Express" software will remain mysterious to us, as mysterious as the behavior and activities of this company that owns the DjVu format. DjVu software was first presented to the public at the AIIM Exposition in 1999, by AT&T Labs. 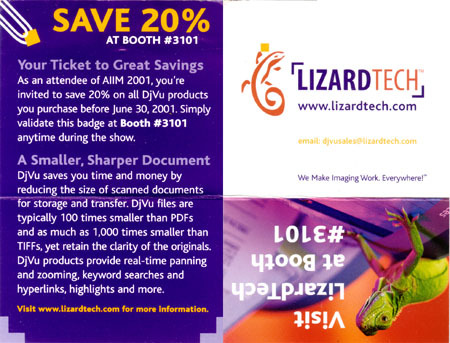 At the AIIM Exposition in 2000, the DjVu format was presented by the new format owner, LizardTech. Note: of course we were irked even back then by the claim "typically 100 times smaller than PDF". See our recent news article: "LizardTech's Distorted PDF - DjVu Comparison".